Leaving Santa Maria dei Miracoli, Ponte Maria Nova and, to its right, Ponte del Piovan cross the forking Rio di Ca’ Widmann in a setting almost too bijou to be real. The lanes lead straight on to SS. Giovanni e Paolo; instead take the first left (under the arches, just after Ponte del Piovan) to the next bridge, the Ponte Widmann. From the bridge you can see the Palazzo Widmann-Foscari, with a façade by Longhena, embedded with Byzantine paterae; this was the headquarters of one of Venice’s later noble and wealthiest families. 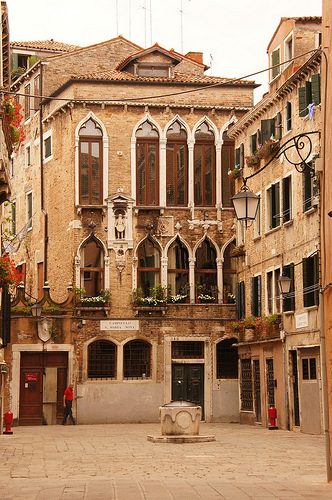 The neighbouring Palazzo Loredan is noted for its 16th-century doorway.